Friday, May 3, 2019, 11:30 a.m. – 1 p.m. It is increasingly common to conduct multiple studies for publication within a single manuscript, particularly in the behavioral sciences. Challenges may arise in this process such as null results, inconsistent findings, difficulty in summarizing multiple analyses, and journal word limit. 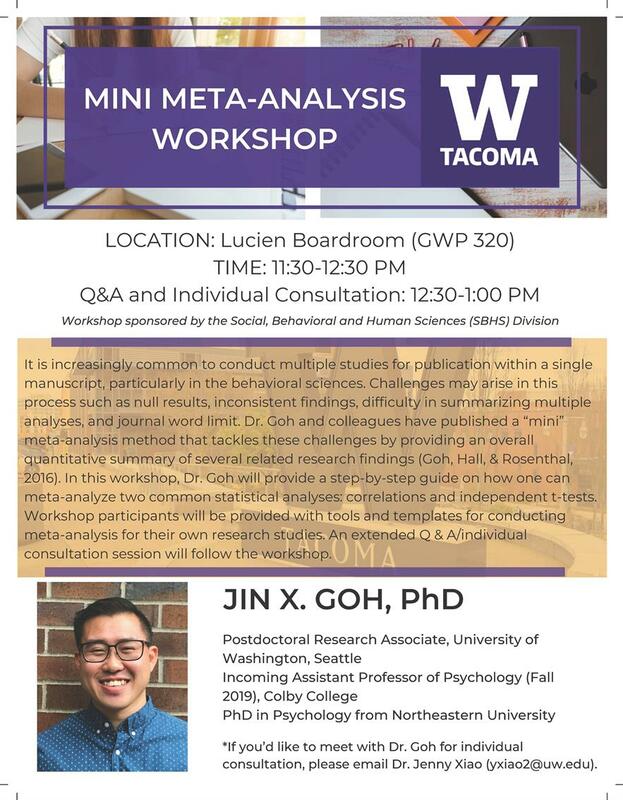 Dr. Goh and colleagues have published a “mini” meta-analysis method that tackles these challenges by providing an overall quantitative summary of several related research findings (Goh, Hall, & Rosenthal, 2016). In this workshop, Dr. Goh will provide a step-by-step guide on how one can meta-analyze two common statistical analyses: correlations and independent t-tests. Workshop participants will be provided with tools and templates for conducting meta-analysis for their own research studies. An extended Q & A/individual consultation session will follow the workshop.